Did the Lord by Moses give to the Jews as a body politic sundry judicial laws which expired with their state? Do they oblige any other now, further than the general equity thereof may require? No. (Exod. 21; 22:1-29; Gen. 49:10; 1 Cor. 9:8-10; 1 Pet. 2:13-14; Matt. 5:17,38-39). Well then, do not some err, though otherwise orthodox, who maintain that the whole judicial law of the Jews is yet alive and binding all of us who are Christian Gentiles? 1. Because the judicial law was delivered by Moses to the Israelites to be observed, as to a body politic (Exod. 21). 2. Because this law, in many things which are of particular right, was accommodated to the commonwealth of the Jews, and not to other nations also (Exod. 22:3; 21:2; Lev. 25:2-3; Deut. 24:1-3; 25:5-7). 3. Because, in other things which are not of particular right, it is neither from the law of nature obliging by reason; neither is it pressed upon believers under the gospel to be observed. 4. Because believers are appointed under the gospel to obey the civil law and commands of those under whose government they live, providing they be just, and that for conscience’ sake (Rom. 13:1, 1 Pet. 2:13-14; Titus 3:1). David Dickson. It is about time I posted something on him. Professor of theology at Glasgow and then Edinburgh universities, co-author with James Durham of Sum of Saving Knowledge, close friend of Durham, profoundly respected in the Scottish church, prolific author and commentator – in short a mammoth figure in Scottish Reformed theology and well worthy of consideration. Dickson’s most formal treatments of the free offer of the gospel are found in his Therapeutica Sacra (Edinburgh: Evan Tyler, 1664). 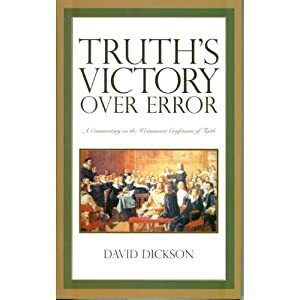 [Sadly Dickson offers no comments on WCoF 7:3 in his work on the Westminster Confession Truth’s Victory Over Error.] I am not going to comment in detail on his views on the free offer this week but I’ll just set some of the scene before picking up on Dickson again next week. This was the overarching theological commitment of all the Reformed figures I have covered on this blog – the entire work of salvation is of God’s grace, power and wisdom. They all present their views of the free offer in a context where salvation is a result of God’s “special love” for the redeemed. It is not possible to deflect the views of Durham, Dickson, Clarkson, Ball, Brown, Calvin, Sedgwick, Manton, etc by claiming they were somehow less than “Calvinistic” in their theology. Dickson interprets 1 Tim 2:4 and 2 Pet 3:9 as referring to the elect. This was the standard Scottish view of these texts during Dickson’s lifetime. I post this to note that there was diversity in understanding of individual texts amongst those theologians who held to the same overall view of the free offer and predestination e.g. for Calvin 2 Peter 3:9 refers to all men and for Thomas Manton 1 Tim 2:4 refers to all men. Incidentally, I read the Scottish theologian Robert Rollock as implying a universal reference to 1 Tim 2:4, “… 1 Tim. ii. 4, after he hath admonished that we are to pray for all men, he addeth, that God will have all men to be saved, and come to the knowledge of the truth. Out of which it followeth, that in the publishing of the Gospel, God hath respect not only of all men in common, but also distinctly of every several person; which regard also he will have us to have in our prayers.” (Robert Rollock, A Treatise of God’s Effectual Calling in Select Works of Robert Rollock (ed. William M. Gunn; 2 vols. ; Edinburgh: Wodrow Society, 1849), 1:215). Sometime Grace is taken for every Gift or Good bestowed by God upon the ill Deserver: In which sense, Gifts, common to Elect and Reprobate, are called by the name of Grace. Rom. 1. 5. Ephes. 4. 7. Dickson has no problems with the terminology of “common grace”. God bestows gifts and good things on the reprobate which is “grace”. I am puzzled by the reference to Rom 1:5 and Eph 4:7 – neither of these texts seem to be speaking of common grace. Reprobation for Dickson is a doctrine that is to be preached. But it is a doctrine that must be preached in such a way as to highlight the outworking of the decree of reprobation as it relates to individuals is archetypal theology i.e. unknown, and unknowable. The doctrine of reprobation is not to shape my view of God’s relation to me as an individual – in this respect it is “not to be meddled with”. Rather we are to beware of “hostile thoughts towards God” and take our view of God from him being our “faithful Creator”. This is a helpful way of explaining the doctrine of reprobation – maintaining faithfulness to Scripture in preaching reprobation while guarding against driving men to despair. Next week I’ll probably post on Dickson’s views on the free offer from Therapeutica Sacra and possibly the week after that from his commentaries.